The price shown is per accommodation, for a Studio Standard 4 people from 11/05/2019 to 18/05/2019 . Looking for a small, authentic and family-friendly resort for your next winter holiday, where you can recharge your batteries? Come and stay at the Les Rives de l'Aure residence. 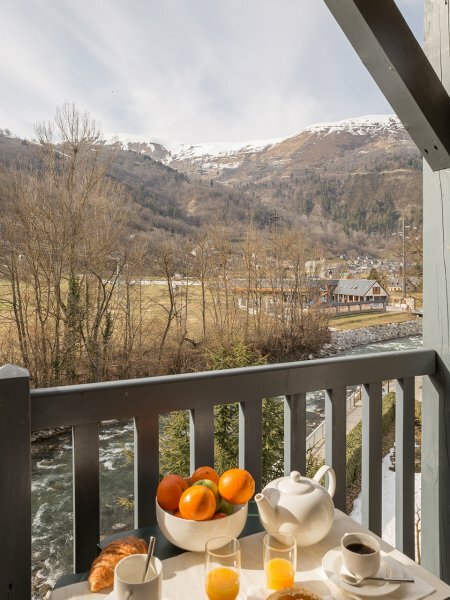 Located in the heart of Saint-Lary-Soulan, a Family ... Plus-certified resort, it benefits from the beautiful natural setting of the Pyrenees National Park. Its regional architecture conceals warm and cosy apartments where you can spend quality time with your loved ones. They open onto a balcony, a terrace or a loggia, from which you can admire the beautiful view across the village or the snow-capped mountains. You won't get bored here! To access the 100 km of marked runs in the ski area, simply take the cable car and the gondola lift located 100 metres from the residence. You'll be able to enjoy all the winter sports and après-ski activities you could possibly wish for. Take it easy after an action-packed day! The whirlpools, bubble bed, or sauna at the resort's thermal baths, accessed via the garden, provide the opportunity to unwind. We've thought of everything for families here. Your little ones can play in the designated play areas and take part in events aimed at their age group. Shops, services and restaurants: everything you need is just 300m from the residence.